Eastern State Penitentiary was opened in 1829 in Philadelphia, Pennsylvania with a new idea for the rehabilitation of those unlucky enough to find themselves incarcerated inside this daunting structure. This "new" approach placed the inmates into constant solitary confinement and hard labor. Cloth hoods were placed over the heads and faces of each inmate when they were removed from their cells to make sure there was absolutely no interaction between any of them nor could there be any chance of them learning how the prison was actually laid out. This method of "rehabilitation" came from strict Quaker ideology--meaning the idea was that if you isolated the inmates from each other, the guards or any other human contact, then the would have to face up to the crime(s) they had committed and as a result become repentant and remorseful for the actions that had landed them in prison in the first place. During their confinement, the prisoners were not allowed any contact with their family or friends; nor were they allowed any news from the outside world. John Haviland, an architect from Great Britain, was hired to designed the new prison. He was told it had to have seven different cell blocks that were to connect in the middle of the prison to a central surveillance area. The cells were to be designed to hold only one person and to be centrally heated and equipped with a toilet, sink, and a private, outdoor exercise yard that was surrounded by a ten-foot high wall. Each cell had a single skylight to provide some natural light to the inmates and in keeping with the ideology, the sky lights were given the name, "the eye(s) of God". The prison remained in operation until the 1970s. Unfortunately, as the years went by, Eastern State Penitentiary developed the same problem as most prisons, the issue of over-crowding. Overcrowding forced the prison officials to start housing two or three inmates in these small, cramped, single person cells and forced the state to add new cell blocks. When Cell block 15, also known as Death Row, was added in 1956, the prison had finally abandoned the original Quaker ideology. Cell block 15 would be the last cell block added to the building. Finally, as the years took their toll and the repair costs became too much, Eastern state penitentiary officially closed down in 1971. However, long before the prison shut down, tales of paranormal activity and experiences were being reported by inmates and guards in the 1940s. One of the most famous of the spooky tales of Eastern State came from the infamous Al Capone. Many of the other prisoners said they could hear Capone incessantly screaming and begging for someone named "Jimmy" to leave him alone. Capone stated many times that this "Jimmy" was a man by the name of James Clark. James Clark was one of the men who was viciously murdered in the infamous St. Valentine's Day Massacre that authorities believed that Capone was responsible for. Many people reported that the spirit of "Jimmy" haunted Al 'Scarface' Capone even after he left Eastern State Penitentiary--and until Capone's death in 1947. 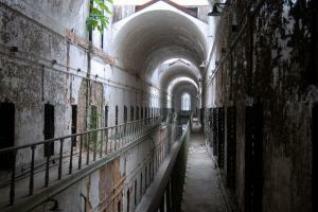 Jimmy wasn't the only ghost to haunt Eastern State Penitentiary. To this day many of the caretakers and tourists report hearing screams, creepy footsteps, disembodied voices talking, whispering, laughing and crying. There are also reports of seeing dark, shadowy figures darting from cell to cell and walking up and down the hallways. The most active areas seem to be Cell block 12, Cell block Six, Death Row, and the Infirmary.